For most, the name Bentley typically conjures up images of posh, stately sedans, tweed jackets, cherrywood pipes and brandy glasses in front of a smoldering fireplace. The Continental Supersports, however, trades this rather drab decorum for something more aggressive – something along the lines of a pair of boxing gloves, a frighteningly large swig of Bacardi 151 and a surface-to-air rocket launcher. It’s utter chaos. This end-all of Continentals is, in fact, the fastest production vehicle Bentley has ever built, and proof that when it boils down to it, some automotive engineers are basically little more than very smart, very talented 12-year-old boys. How you propel nearly 5,000 lbs to 60 mph in well under four seconds is anyone’s guess, but it turns out a 6.0-liter W-12 with a pair of turbochargers is a good place to start. The Supersports is the Continental with a twist – weight reduction, no back seat, a more aggressive all-wheel drive tuning, a superfast shifting transmission and more carbon fiber than an entire peloton of Tour de France bicycles. A quick spin around the block in this car will have you exiting the driver’s seat feeling as though you’ve just blown up the Death Star and walked away with the girl. If you’ve managed to keep yourself out of jail, that is. It has so much power that half the throttle travel seems more than sufficient. Few cars can put as stupid a smile on your face, and true enough, few are as stupid fast. Basically, everything. From the massive torque offered by the Supersports’ twin-turbo twelve-cylinder engine to the gorgeous leather-adorned interior complete with the finest, most ornate carbon fiber-shelled sports seats we have ever sat in. 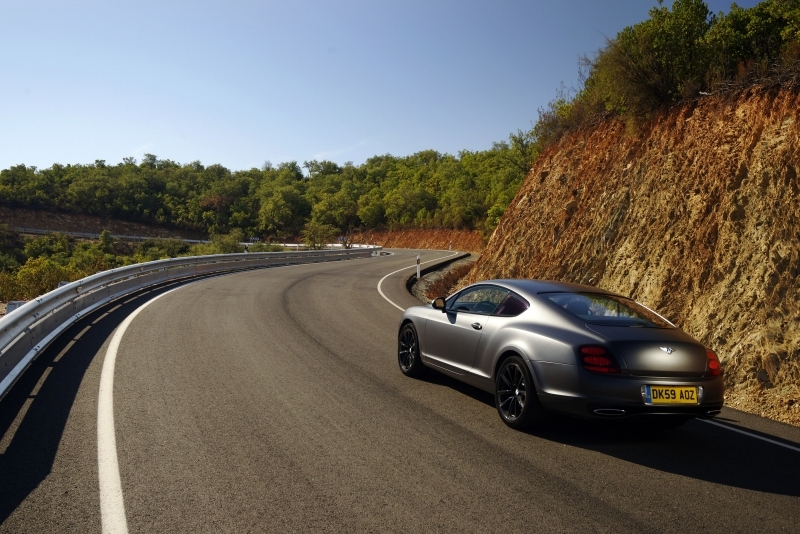 It’s a Bentley that can do 204 mph. In short, there is a lot to like here. There are but a few small clouds in an otherwise clear sky, and these are for the most part paltry complaints. The switchgear and controls feel dated, and are certainly not what you would expect of Bentley. Case in point – the radio has a “Loudnessâ€ button that boosts the equalizer. Really? The last time we saw those was sometime back in the ‘80s on a Sony Walkman. A massive, heavy yacht of a car, the Conti Supersports performs a neat trick when driven hard, shedding its ample weight and shrinking around you. But then again, few vehicles exist that feel somewhat less than spry when all 621 turbocharged horses hit. In the case of the Conti Supersports, acceleration is a warp-speed affair filled with 12-cylinder howl and all sorts of whooshes and gasps from the turbochargers. Sure, the car’s weight begins to tell a bit in the corners, but not nearly as much as you would think. Bodyroll is a non-issue thanks to the taut air suspension (well, so long as you have it set in the stiffest of four settings), throttle response is fantastic for a vehicle of this size and the powerband is so utterly devastating that you can actually feel all four wheels clawing for grip as you exit a bend. But you still have to bring all that weight back down to everyday speeds at some point, and the carbon ceramic brakes – the largest fitted on a production car – are searingly effective once you get through the first vague bit of pedal travel. Overall, this is a car that’s easy to drive very, very fast. And then there’s the sound. If we’re being modest, we’ll say it sounds powerful and mechanically verbose; but if we’re honest, we’ll say it sounds quite expensive. We wouldn’t have it any other way. As lovely a show as the Continental Supersports puts on both outside and in, the grand finale is most certainly its engine, a massive 6.0-liter twin-turbocharged W-12 (think V construction, but with a minor offset on each bank of cylinders) that puts out 621 horsepower and 590 lb-ft of torque. Power is driven to all four wheels (because honestly, if it were driven through two, drivers wouldn’t survive long) via a superfast shifting six-speed automatic transmission. Brakes don’t get as much credit as they deserve in the automotive media, but none deserve more press than the pizza-sized discs fitted to the Continental Supersports. Fashioned out of carbon ceramic to resist brake fade, the eight-piston 16.5-inch front and 13.0-inch rear rotors have little issue in bringing the near-5,000 lb Conti to a screeching halt over and over again. Stopping in this car is almost as fun as mashing the gas. Almost. The Conti Supersports has the requisite tech expected of every modern supercar, personified by a multi-function screen situated within the dash. Everything from the navigation to the stiffness of the air suspension and ride height can be controlled from this display, though the navigation system does feel significantly dated. The terrifyingly loud Naim audio system is, quite literally, not to be missed. Considering it makes well over 600 hp, you might be surprised to learn the Supersports actually carries with it some green credentials. Ok, in terms of gas mileage, the news isn’t so good at 12 mpg city, 19 mpg highway. 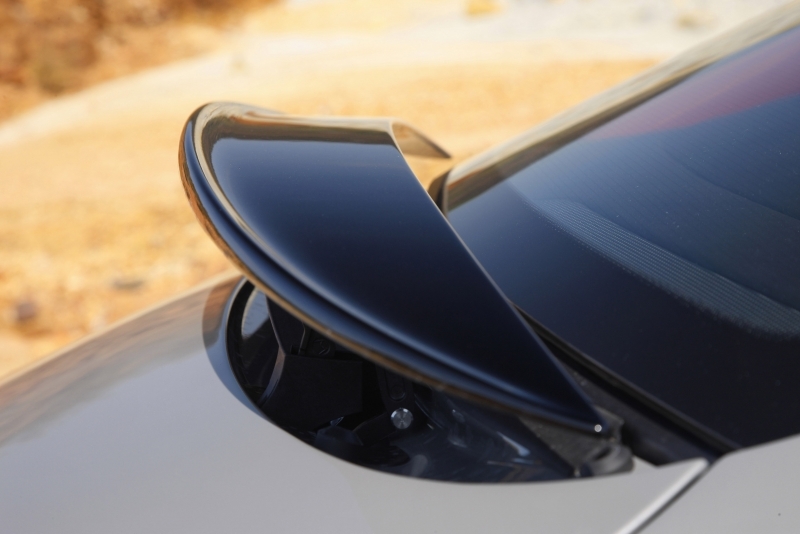 But the car does run on planet-friendly E85 flex-fuel, which produces less CO2 when burned. Simply put, one of the best-executed interiors of any vehicle on the market, with tons of leather, suede and alcantara throughout the interior. But the highlight has to be the sports seats, which are some of the most comfortable carbon shells ever created. And the carbon brace bar that crosses the rear cargo area is just plain cool. It’s sporty, but it’s a Bentley, so a gentleman would still feel at home with his Bluetooth in ear, buying and selling entire corporations on the drive to the office. 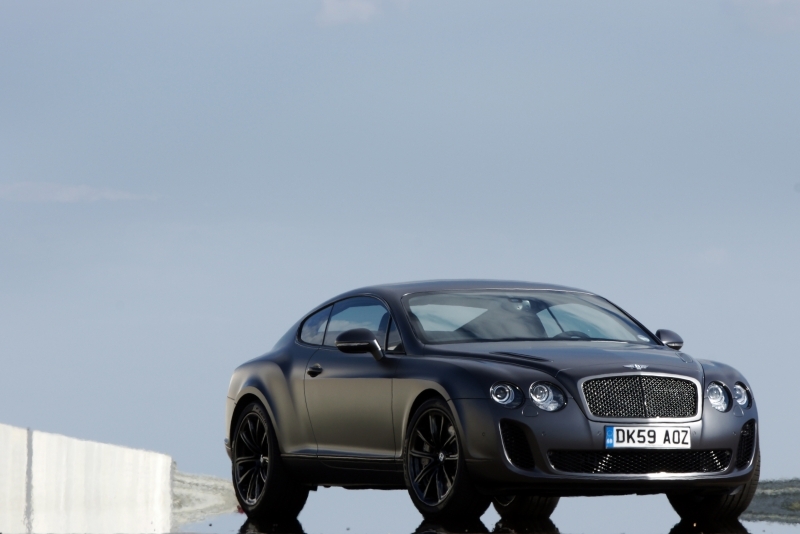 The Supersports is visual proof that the stately Continental does, in fact, have an evil twin. In dark colors, it’s particularly menacing due to the black forged-aluminum 20-inch rims blending with the dark carbon ceramic brakes. Massive air intakes in the front aid in cooling off the engine and provide an aggressive fascia, while the flat-bottom diffuser at the rear screams of the company’s Le Mans heritage. 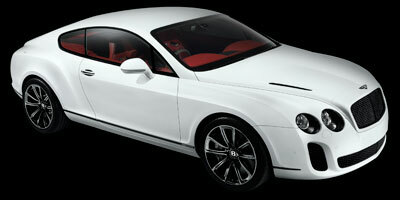 At $267,000, the Continental Supersports is at the top of the supercoupe game. Among the vehicles it competes with up in said stratosphere are the Aston Martin DBS ($269,000) and Ferrari 599 GTB Fiorano ($302,600). The Bentley Continental Supersports is a unique piece of madness. As strange a concept as a “lightweight, sport-tunedâ€ Bentley is, they’ve certainly succeeded in executing a full-force supercoupe quite unlike any other on the market. Simultaneously charming and terrifying, there are few experiences out there that add up to this.